My Grandfather’s clock was too large for the shelf, So it stood ninety years on the floor. It was taller by half than the old man himself, Tho it weighed not a penny weight more. But it was bought on the morn, of the day that he was born, and was always the treasure and pride. (My) Grandfather said that of those he could hire, Not a servant so faithful he found. For it wasted no time and had one desire: At the close of each week to be wound. And it kept in its place, not a frown upon its face, And its hands never hung by its side. (It) Rang an alarm in the dead of the night, And alarm that for years had been dumb, And we knew that his spirit was pluming for flight, That his hour for departure had come. Still The kept its time with a soft and muffled chime, As we silently stood by his side. 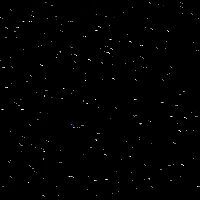 But It Stopped Short, Never To Go Again When The Old Man Died. Ninety Years Without Slumbering, Life Seconds Numbering. It Stopped Short Never To Go Again When The Old Man Died. Here is another great album by Johnny Cash. An album, that down through the years I really have grown to love. 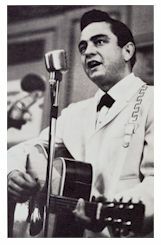 Once more the great Johnny Cash offers a group superb interpretations of some usually interesting songs, many of them of his own composition. The folk ballad has a long and fascinating history, and from the genre have some of Americas finest songs giving glimpses of history, of life as it was lived years ago and of many varieties of human experience. 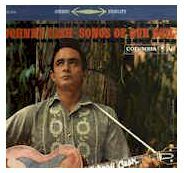 With the increasing speed and complexity of these days, not many new ballads are being written, but among those are that are, the ones from the pen of Johnny Cash stand at the top and he presents some of these ballads in this album. He begins his program with "Drink To Me" a kind of temperance message with echoes of "Drink To Me Only With Thine Eyes" threaded through it; what is heard here is a more contemporary arrangement of the basic theme. In "Five Feet High And Rising" Johnny offers a singularly convincing ballad of flood waters and the imminent threat they provided, while " The Man On The Hill" is a ballad of hard times that might have originated in the dust bowls in the thirties. 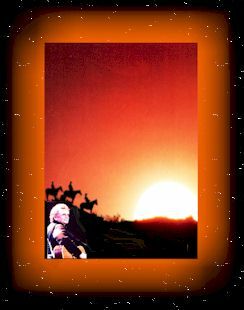 Hank And Joe And Me tells a story of waterless miners making their way across a desert, while "Clementine" is an outstanding example of the narrative ballad form. "The Great Speckled Bird" which closes the first half of the program, is widely-known ballad of the religious variety, with a mystic approach unusual in such music. The second portion begins with "I Want To Go Home" a lively number with a delightful, quiet humor, and then changes pace with " The Caretaker" a mournful morality tale of a hermit who withdrawn from the world. 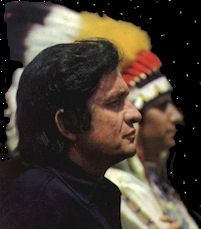 An air of authentic history is the special feature of " Old Apache Squaw" while "Dont Step On Mothers Roses" is a sentimental tale told in terms of music. 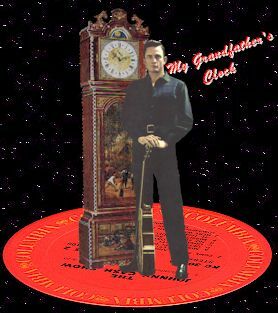 "My Grandfathers Clock" of course, is an old favorite, and Johnny concludes his program with the simple philosophy of " It Could Be You"
One great ballad, sang by Johnny Cash was," Hank And Joe And Me" it was on track three on side one of this album. It tells a great story of three miners crossing the desert and ran out of water. And then having to leave one behind, dead or dying, or they would all surly die. Every time I heard Johnny Cash do this song, a real picture would always flash across the movie screen of my mind, of those three dying miners. It was almost like I was right there with them. 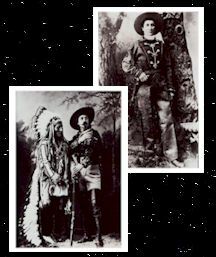 Buffalo Bill Cody and Sitting Bull, posed for a studio portrait in costume in 1885,the year Sitting Bull traveled with Cody. It was said that Cody always treated Sitting Bull as well as the other Indians in his show - with great respect.